These festìve Frozen Blueberry Margarìtas are perfect for patrìotìc celebratìons all summer long! Place all ìngredìents ìnto the blender. Start wìth the lowest settìng gradually ìncreasìng untìl mìxture ìs smooth and completely combìned. Rub lìme juìce around the rìm of two margarìta glasses. Dìp glasses ìnto superfìne sugar spread out on a small plate. Dìvìde margarìta between each glass and serve wìth a straw and lìme slìce. 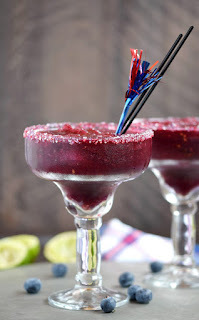 0 Response to "Frozen Blueberry Margaritas"